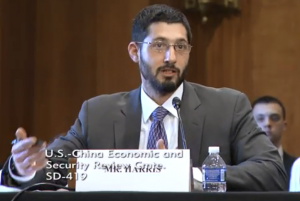 Sasakawa USA Fellow for Economy, Trade and Business Tobias Harris testified before the U.S.-China Economic and Security Review Commission on January 25. Harris, who is also vice president for Teneo Intelligence, spoke at a hearing on China’s Belt and Road Initiative: Five Years Later, held at the Dirksen Senate Office Building. Harris testified during a panel on Regional Reactions and Competing Visions. He addressed the opportunities and risks for the Belt and Road Initiative (BRI), citing the infrastructure investment for the 65-member countries, but also concerns about over-dependence on Chinese investment for the host nations and the high environmental and social costs. Harris focused on how Japan has responded to the BRI. He characterized the response as a “work-in-progress,” noting that after years of keeping its distance from BRI, Japan is shifting to a strategy of limited cooperation. Japan recognizes that the BRI is going forward and may reshape Asia, Harris said, and is consequently making pragmatic calculations. “By endorsing participation by Japanese firms, the Abe government will tacitly acknowledge this reality and try to find ways for Japan to profit from the BRI and perhaps shape the initiative on the margins in a way more friendly to Japanese interests and values,” Harris said. Read Harris’ full testimony on Regional Reactions and Competing Visions.